This made me smile. I love this. Dude, We know we are Aspies and they can call it what every they want. It changes nothing. I am an Aspie and Proud! Awesome blog. Keep up the good work! It sickens me to think that the name is changing. Because people with aspergers really need more confusion in their lives! LOL, true... less confusion, please. 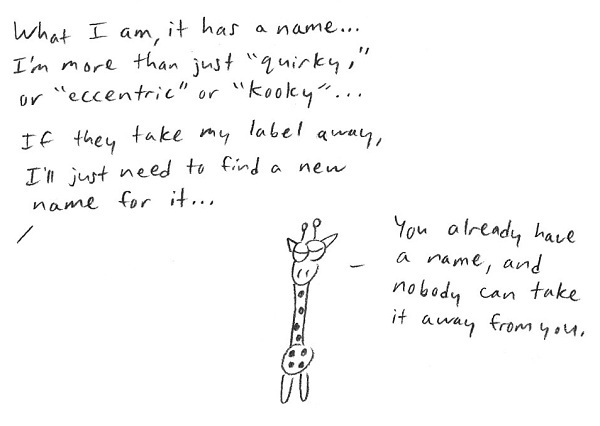 But some people are simply quarky and eccentric without having Asperger's/Autism, and they claim the label with no clinical validation. 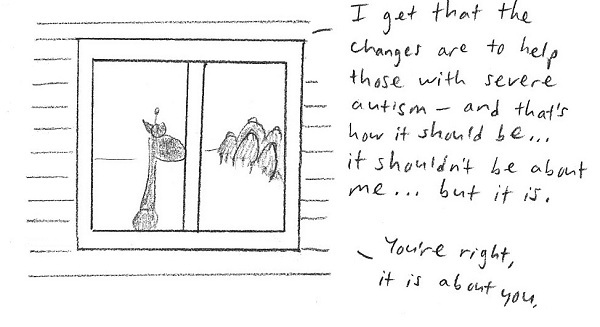 Having Aspie traits doesn't mean you are on the Autism Spectrum. And not having "clinical validation" doesn't mean you're not. I studied autism and Asperger's, and studied myself, extensively before coming to terms with the fact that I have Asperger's. 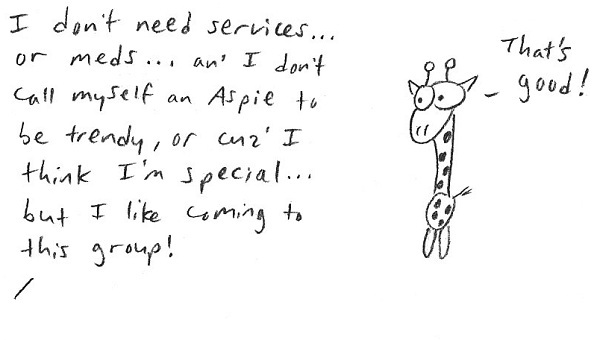 But if I go on a forum and say, "I'm an Aspie," in the eyes of other people I'm the same as someone that saw that people with Asperger's are socially awkward and then said, "I'm an Aspie." 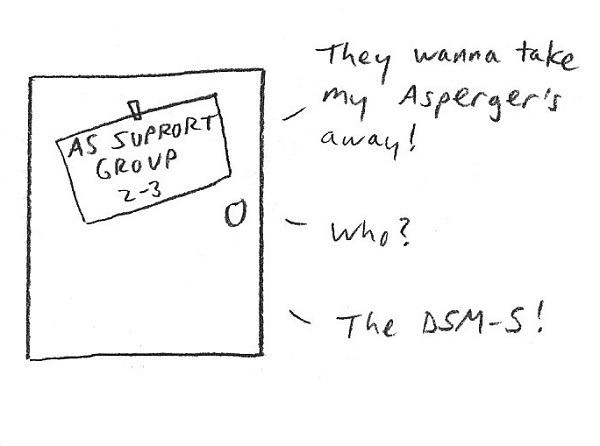 And of course, two people can be diagnosed as having Asperger's while one really has it and the other is just awkward. The way I see it, I know I have Asperger's because of two things. One, I relate to a lot of the stuff written about it; I have many of the traits, and the description of what Asperger's is, or can be, fits me. Two, I relate to other people that have Asperger's. I'm part of a support group for adults with Asperger's on Facebook, and routinely, when someone says, "I do [some weird or uncommon thing]. Does anyone else?" I and others respond with, "I totally do that! You're not alone! I'm not alone!" If a psychologist, with a real degree and practice, told me that I didn't have autism, I'd shrug my shoulders and walk away. Based on what I've read and seen about autism, and how much I know about myself, I know that I have it, and because of how much I relate to people with autism, concerning things that may not have anything to do with how one acts socially, I know that I have it. I've never seen a psychologist about it, and I may never get the chance to, but I know who I am. But like I said, I've studied. And at times, I didn't want to be autistic, and I told myself that I wasn't. It was a struggle. Some people try to find an easy excuse and may label themselves as Aspies when they're not. That's bad. But some doctors are simply bad at what they do or don't know enough about autism and Asperger's, and a lot of people can't afford to see a doctor for something that isn't life-threatening. What do we do? How do we tell the real Aspies from the fake Aspies? I don't know, and that's why it's a sticky situation, but we can at least remember that some people are fakes while others are real. Sorry for the long post. I tend to talk a lot. I agree with Nicomachus. 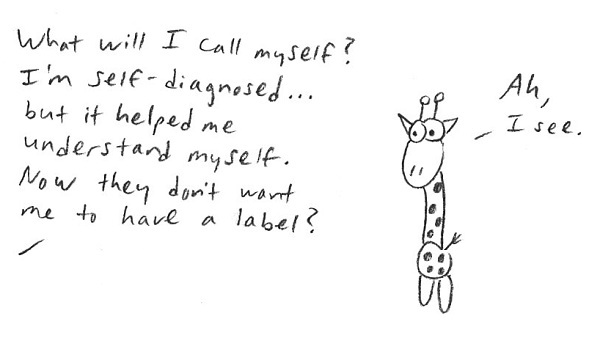 My self-identification with the diagnosis and the AS community helps me. I don't see how that takes anything away from those who are clinically diagnosed; certainly not services or resources. I never represent myself as anything other than "self-identified." The only people who take issue with that have never met me in person, and if they want to disagree, then that's their right; their opinion doesn't concern me. Generally speaking, I feel that those who self identify have done research. Not just looked at the words and go "that's something that relates to me" or "I do that so I must be"...(just my opinion here following) those I feel would have the greatest chance of being "clinically validated" are those whose research into not only themselves but the Asperger's was, and still is, a painstaking journey. Self denial can occur as often for those validated as it does for the non-validated, and I can't speak for others but that's a major hallmark for me. I didn't take a month or 2 of research. I took my time (a couple of years), and at times I didn't believe it could be me. Even at times now I think "this can't really be happening, but I'm not imagining these feelings and things I've said or done"... I wanted an answer as to why. I have one. But some days I wonder if I've done something wrong along the way... but how can I have done something wrong when I've re-checked the equation a thousand times over? It's an internal battle ever waged through time. A result of society's insistence on how we should be, act, and think? Perhaps. I think for me, the changes would feel exactly as you described in the cartoon. I've found who I am... and despite my self doubts, I feel correct in my identification. As it stands, I feel that perhaps the self doubts actually help secure that feeling. If I have confused anyone, I apologize. I just feel so many times that I am in the midst of my own mental war. Confusion, self doubt, worries... I had best quit while ahead. I feel myself reeling inward and that's the start of my Aspie Moments, as I tend to refer to them when speaking to my b/f. Thanks again for a motivating, riveting doodle. Perhaps not as light as many others, but nonetheless. It still follows suit in making me glad that I'm following this blog. I agree, Chris, in my experience most of the self-identified people have taken time and care in coming to that conclusion. I get your point about the self-doubts too; they come with being on the spectrum, no way to avoid them. Thanks for the reply! I re-read it and felt I got a little long-winded there! And say "a couple of years" makes it sound almost like I didn't take that long to do it, and yet each day I made it a point to look something up on the topic. Often times getting my b/f involved. A long way of saying thanks! There are just days when no matter what any "data" says, I still feel alone and unsure. It's nice to be reminded in a wonderful way that I'm not! I'm forwarding this link to my husband, who is an Aspie. 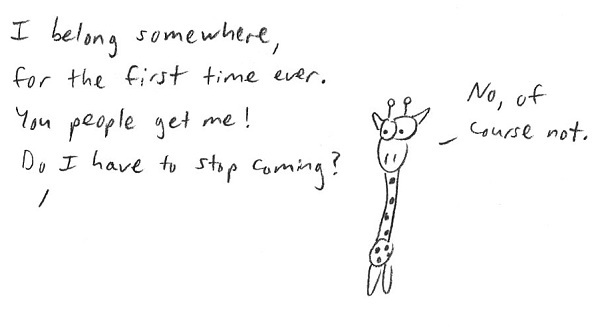 That's really sweet and to the point -- and I just love your little giraffe guy. Thanks! But you did use Foghorn Leghorn and that's just as good, in my book.